A group of kids open military barrels from which escape a deadly substance that both kills and later revives the dead. 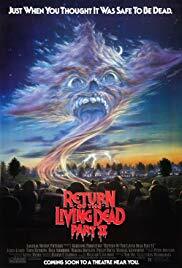 Directed by Ken Wiederhorn (Shock Waves), this sequel to the awesome classic Return of the Living Dead(1985) inherited from the original, in my opinion, more drawbacks than qualities. Similar to the first movie in that it is primarily a comedy, the best part of this sequel is the zombies themselves. They are really well-made, funny, and their constant craving for brain is hilarious. But to fun, there wasn’t much else to be enjoyed about this one. The over-exaggerated acting, so typical of horror comedy from the 80’s, is here pushed way too far beyong what’s bearable. Some or the actors are constant screaming and are just too irritating for the viewer to remain focused on the movie itself. Not that is much to focus on anyway, the movie is an accumulation of poorly made action scenes with no story whatsoever. I still found the first half of it genuinely funny, but it quickly gets really repetitive. After the initial excitation wore off, the second half bored me to death.